A group of Indiana State University business students spent several weeks learning lessons by serving as teachers. The ISU business students volunteered their time to teach children and preteens at Ryves Youth Center at Etling Hall and the 14th and Chestnut Community Center. They spoke to young adults about maintaining proper health, and the Indiana State business students led a donation drive to collect toiletries and other items to be used at the community centers. "We were able to provide effective lessons, and the students were interested in the lessons we taught them on either oral hygiene health or bodily hygiene," said Amber Kemp, junior business management major from Terre Haute. In order to make the experience more engaging for the kids and preteens, the ISU business students created humorous educational videos showing proper health techniques. After playing the video, some students facilitated group discussions to build on the lessons, said Miguel de la Rosa, a senior marketing major from Greenwood. "This made the youth more engaged compared to being told the negative things that could happen to you if you didn't bother to properly maintain your health," de la Rosa said. The students held a donation drive in the Hulman Memorial Student Union Commons where students, faculty and staff donated to the nonprofit facilities. "We are always glad to have ISU students come here for a class project," said Jim Pinkstaff, educational coordinator at Ryves Youth Center. "They bring energy to each project they conduct. And, sometimes the volunteers fall in love with what we do and continue to help out well beyond their class requirement." 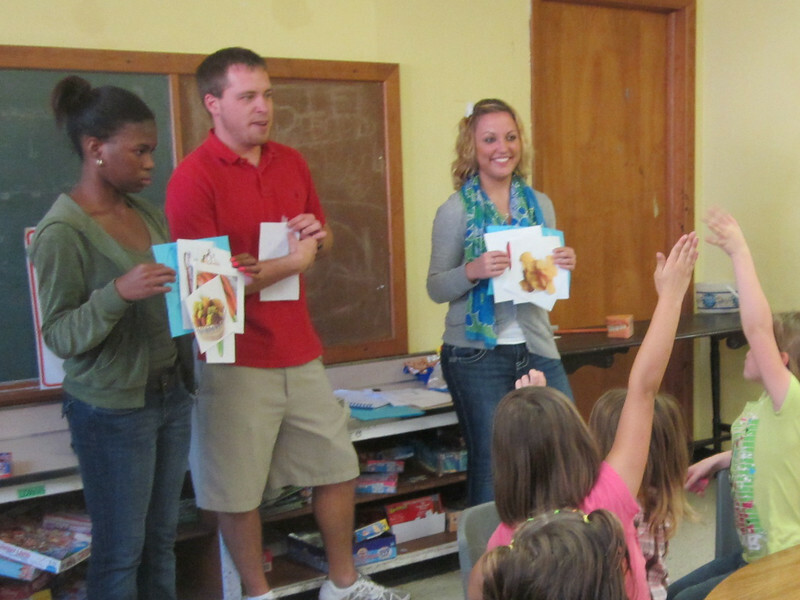 ISU students volunteer on a weekly basis and keep the community centers well-staffed. "Indiana State students are vital to what we do," Pinkstaff said, "They enrich all aspects of our program, especially the recreation and education programs within the Youth Center." This project was part of a business class that required volunteering with a local nonprofit organization. Art Sherwood, associate professor of management, implemented several community service projects as a way of teaching the students more about the course curriculum. He and some students were surprised to learn about the kinds of basic items that he and the business students have around the house every day that the children in the community centers could not afford. "The students went well beyond what I expected in terms of the teaching that they were going to do and doing it in a really creative way," Sherwood said. "That was impressive to see." Ryves Youth Center and the 14th and Chestnut Community Center continue to open their doors and have offered services to the Wabash Valley for more than 25 years. Bill Felts, director of the 14th and Chestnut center, said that most of the kids at that facility come from single-parent homes, and some live in the midst of violence. "The children here need positive role models, and this is where college kids are such a blessing to us," Felts said. It is important to get people in the community more involved in volunteering, said Jennifer Groove, junior accounting and finance major from Terre Haute. The experience working with the kids at the two Terre Haute youth-oriented centers allowed for ISU students to volunteer while passing along what they know. "It is important for us to serve as older role models and to take the time to teach lessons to younger generations," Kemp said. Photo: http://isuphoto.smugmug.com/photos/i-nnSLBg6/0/L/i-nnSLBg6-L.jpg (Submitted photo)Three Indiana State University business students lead a class session of youth at a local community center. A group of business students worked with the at Ryves Youth Center at Etling Hall and the 14th and Chestnut Community Center to learn more about the lessons that they were learning in their class. The students volunteered their time to teach children and preteens at Ryves Youth Center at Etling Hall and the 14th and Chestnut Community Center. They also led a donation drive to collect toiletries and other items for the centers.